One of the things I was looking forward to this year was getting back on the track for some racing, something I haven't done since 1999. 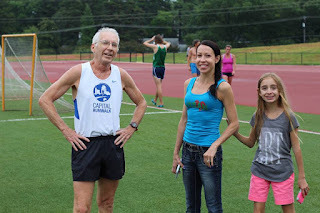 In my post on looking ahead back at the first of the year, one things I didn't mention is that one of my goals is to beat the time I ran in that last race which was 6:32. 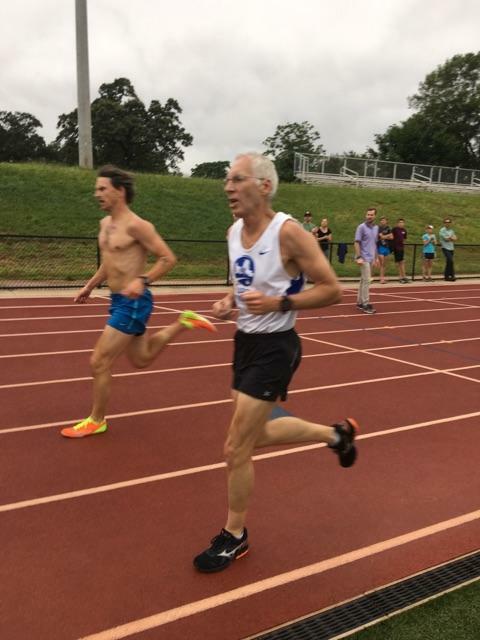 Pretty audacious to think I could do that at age 60 but I have always felt like if I worked on my speed it was within reach. Running that 6:04 in the down hill mile two weeks ago was a real confidence boost but I know it was going to be a lot harder on the track. So finally the day arrived and I was very excited but a bit nervous. 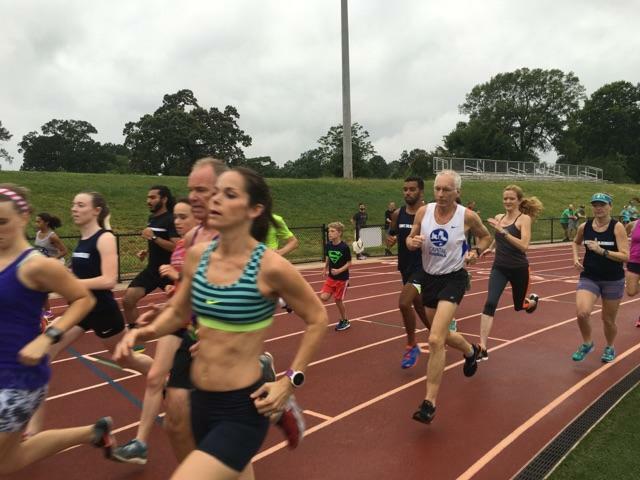 I arrived at the track and was happy to see quite a lot of friends and familiar faces as I began my warmup. It was very cool that Kris Vegh, a former co worker and NC State runner caught up to me and slowed down to run some with me. Just as I finished a mile I saw that my cheer quad, Laura and her 3 kids had arrived as promised. This was going to be great !. I got some water and talked to a few people and then it was time for a few strides and make my way to the start. Wow this was all happening so quickly. I lined up a few feet behind the young and faster crowd and then we were off. I really didn't want to go out too fast but it was hard not to with the adrenaline flowing and trying to make sure I was able to get into position along the inside lane. Isabella was positioned around the middle of the backstretch cheering so I waved and then I got to the 200m mark and , whoa this is quick ! But I felt good and kept going. Julian was in the middle of the curve and I waved to him. I was hearing quit a few people calling out my name and cheering. There were a lot from the running community and it seemed like a very large group of present and former co workers from Capital Run Walk, most of whom ran for NCSU or area high schools. This was great ! 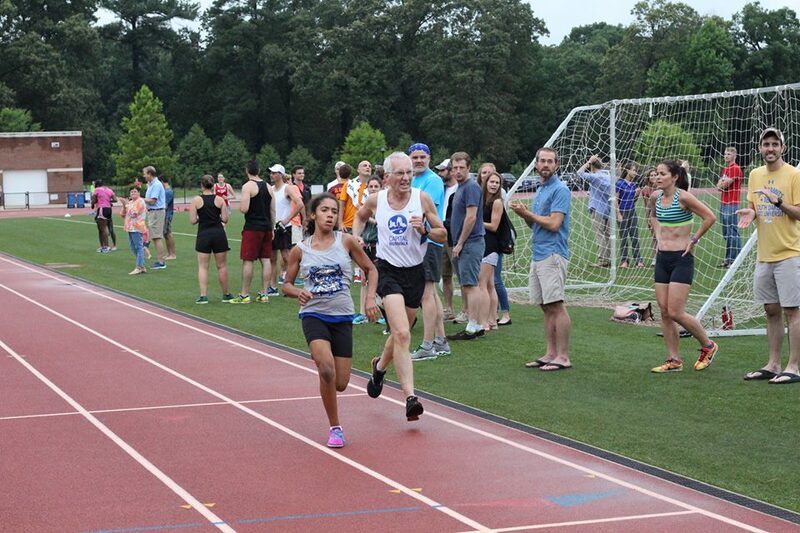 I came into the first lap and saw Laura and Sophia there and then I saw the clock. 1:31 for the 1st 400 m. Way too fast ! I really needed to be more around 1:36- 1:37 but I was on the same pace as the downhill mile ! This was going to really hurt. I tried to back off a little and that was easy ! By now I was already working hard and having doubts. I could still hear the cheers but I was focused dead ahead on the track trying to hold on. 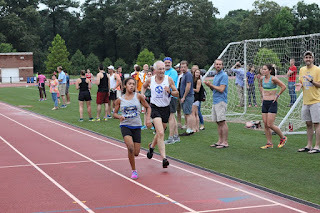 Lap two was a 1:40, or 3:11 for 800. I heard Laura call out I was still on pace for about 6:24. Only 800 to go but I was working so hard. I tried to do the math and I knew I had a shot but I couldn't slow down at all. Lap 3 has always seemed the hardest and tonight was no different. My body was screaming at me to slow down but I was trying to just hang on. I could feel the power leaving my legs so I had to back off just a hair. Oh, that lap seemed to take forever ! Got to lap three and my split was 1:44. A bit disappointing with 4:55 for the 1200. I heard Laura yell out make it hurt. LOL I had already done that ! But I just had to hurt for one more lap. And it did. It would have been so easy to back it down and just say I didn't have it in me today but I couldn't do it. Not and let myself down and not for my support team so I just pushed on. I could hear Bella yelling and then out of the corner of my eye saw her turn and make a dash toward the finish line. Just go ! And then with about 120 meters to go I began to go as hard as I could. So many cheers but it was all tunnel vision and pain, focused straight ahead. I began to tie up with about 30 meters to go but just dug deep and hit the line in 6:35. The cheer squad was waiting for me but all I could do was gasp and make death noises while Laura was telling me how awesome it was . I felt like collapsing in a heap but thankfully no dry heaving and I quickly recovered. I had picked it back up to 1:40 for that last lap. It only took a moment to get over the disappointment and feel happy, proud and excited with what just happened. I came so close missing my goal by just 3 seconds in my 1st track race since 1999 ! When I was 43 years old !! And thats after just 3 speed workouts. I really feel like now that with a bit better pacing and more experience I can get below 6:30. How far below remains to be seen.